I have teamed up with the beautiful Felicia C. York, the author of Counter Girls to give one lucky winner a digital copy of this amazing book! I downloaded the book recently for my IPad and I cannot put it down. As an aspiring make up artist and beauty lover I can relate to every word in the book. Delve into the secret world of the makeup artists that work at your favorite brand at the largest department store in NYC. Kelly, Lexie and Pilar are in various stages of their careeer but face a monument of drama in love and lipstick. Sweet Southern belle Kelly tries to live her happily ever after with the love of her life. She believes she has it all together but one mistake unravels the life she's trying to build completely. Was it self-sabotage or just plain circumstance that left her alone picking up the pieces? Liable Lexie always plays by the rules but when she tries for a promotion, she realizes that nice girls finish last and decides to play to win. If she thought climbing the ladder was tough, finding a boyfriend in NYC is even tougher. Once she finds out just how ugly the beauty industry can get, she plays by her own rules to get the job and the man. Poisonous Pilar, the twelve-year veteran, thinks she's the puppetmaster behind the scene. As she faces the fact that she's only getting older and the new artists are only getting younger, she finds herself looking over her life and realizes the pretty wall she's put up around her has cracks in it and eventually comes tumbling down. She must ask herself if she is willing to leave behind the life she has to pursue the life she really wants. 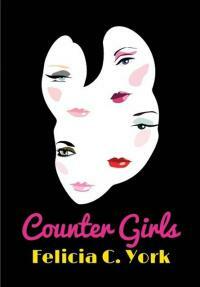 Counter Girls reveals the secret life of the women (and men) who work for your favorite makeup brands. Deeply analytical, light-hearted and chock full of makeup tips and tricks; it is a great read for everyone from the cosmetics connoiseur to the person who doesn't know their lipstick from their eyeliner. Root for the underdog, despise the villain and then realize that they may be one in the same. is comment on this post with your email. your computer and most other E-readers. Don't miss this opportunity, this book is perfect. This sounds awesome, I do love a good book :). Sounds like a good read for all of us who love beauty!